Today's real-time digital oscilloscopes are easier to use than their predecessors, and new models get easier all the time. Oscilloscopes often are equipped with touch screens and elaborate user interfaces that provide a plethora of shortcuts and smartphone-like touch gestures that make common operations extremely fast and easy. For example, Teledyne LeCroy's oscilloscopes with bandwidths of 200 MHz and higher are equipped with the MAUI with OneTouch user interface, which makes using an oscilloscope convenient, efficient, and intuitive. The UI performs all common operations with a single touch of the display using gestures you're used to from your phone, such as dragging, dropping, pinching, unpinching, and flicking. We'll discuss a few examples here. For example, say you have Ch1 set up in a specific way and you want to duplicate that set up in Ch2. You'd simply touch and hold the descriptor box for Ch1 and drag and drop it onto the descriptor box for Ch2 (Figure 2). The same operation would serve to copy setups for math operations, zooms, and parameter measurements. channel setup, we touch and hold the descriptor box for the item we want to change, and drag and drop it to the trigger descriptor box, or parameter of interest, and so on. You can also drag a channel descriptor box into the open dialog controls for, say, a math setup. Next, here's how to Add New, with "New" being a channel, math operation, zoom trace, or memory. The Add New box is the area with a plus sign in it to the right of the channel descriptors on the display. You can touch that Add New box, which opens a dialog from which you can choose what New item you'd like. Or, drag a descriptor box onto the Add New button to create a new item. If you want to turn off a waveform trace or a parameter measurement, you simply "flick" it away by pushing it briskly toward the bottom of the touch screen. Cursors, which can be a challenge to deal with if you have multiple waveforms on the display, become easier with OneTouch. Underneath thetime base descriptors at bottom right of the display are cursor values. By touching, holding, and dragging those values to a waveform, the cursors are automatically placed on the grid at 2.5 divisions from the left and right and 7.5 divisions down from the top of the grid. There are more general uses for gestures, too, as well as multi-touch gestures. 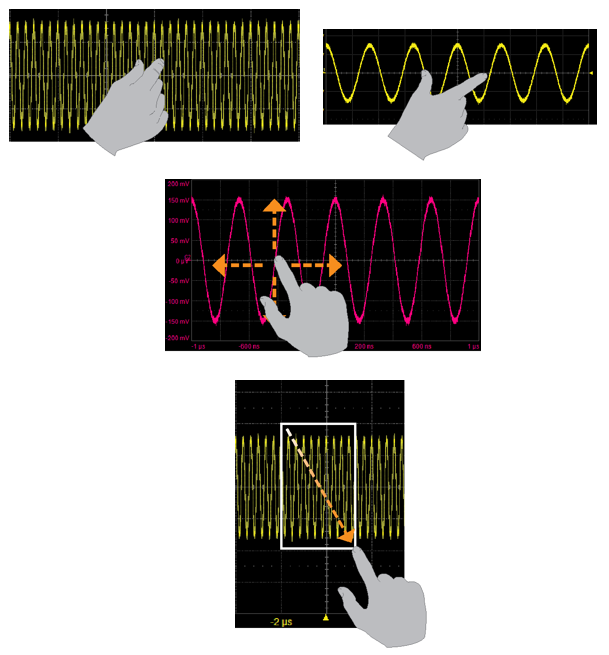 You can use a fingertip and thumb to pinch or unpinch a waveform to zoom in or out. Waveforms can be dragged right or left within a grid to adjust their horizontal positioning or up or down for vertical positioning. You can also drag a finger diagonally across a waveform to create a new zoom of a section of interest. 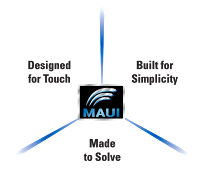 Nearly everything on the MAUI with OneTouch UI can be dragged. Sometimes it's easier to show something than to describe it, so to that end, we've created a series of 10 short videos about MAUI with OneTouch. Take a look if you haven't seen the UI in action. In our next post, we'll cover a couple of handy tips for setting the preferences in your oscilloscope.